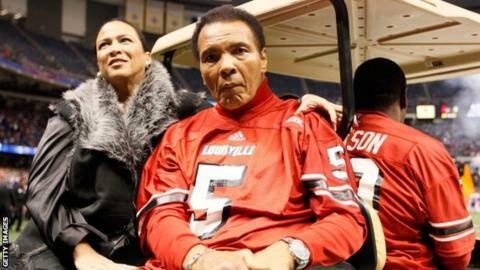 Two of Muhammad Ali's daughters say their father is laughing at the rumours of his demise. Ali, 72, has had Parkinson's disease since 1984 and there has been constant speculation that his health is deteriorating. But his daughters Maryum and Hana have told BBC Sport that their father is in good spirits. "He likes being talked about. He thinks it is funny and says he isn't dying," said Hana. "Even when these stories come out he gets excited and thinks he is going to make the front page of the papers." Ali appeared frail when he attended the opening ceremony of the London 2012 Olympics but Maryum and Hana say that despite his condition, he remains alert and active. "Most stories come from people who don't understand Parkinson's," said Maryum. "He has never been on his deathbed. He has Parkinson's, he has had it for 30 years and it is a progressive degenerative disease but he does well and is healthy outside the Parkinson's. "For some people it is so hard for them to see the old Ali and this Ali suffering with Parkinson's but he is doing well. He enjoys his life and he is clear-minded - he doesn't have dementia or Alzheimers and understands who you are." Hana, who is in London with her sister and director Clare Lewins to promote the British release of documentary "I am Ali", says that she speaks to her father every morning when his speech is at its best. "In the morning he is at his best and he is talking clear and low and you can hear every word. It is too bad the world doesn't get to see that," she admits. "As the day goes on, he gets more exhausted but he is not in any physical pain and is exactly the same person inside. Sometimes when you call him and his energy is low, he just make a clicking noise down the phone. "When we visit him we know he enjoys us being there. He isn't bedridden, he is up every day watching westerns or Elvis movies or watching movies about himself. He just loves to watch himself."